Surround yourself with pink roses and breathe in the blissful love that they hold for you. Roses have always symbolized love. The name of this image is The Rose Quartz Rose. This pink rose reminded me of rose quartz — the stone of unconditional love and compassion. 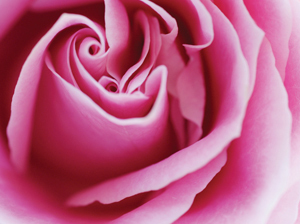 The pink rose helps open our hearts to the divine love awaiting us all. It also stands for compassion, and the essence of the rose is one of the purest vibrations in existence. The color pink symbolizes gentleness, unconditional love and compassion. Pink opens your heart chakra and reminds you that only love is real. Call upon Archangel Ariel, whose aura is pink, to help you with bravery, courage and focus. She will also help boost your confidence. Archangel Ariel will help you manifest anything you want. Try this ritual; in the morning start your day applying rose essence to your heart center. In your meditation, place a small piece of rose quartz directly on your heart. You will help heal your heart and open your heart to unconditional love for yourself and others. Robyn Nola’s passion is photographing the joy, peace and beauty she finds in nature and transforming them into powerful healing agents. She has photographed and created Blooming Affirmations, Blooming Inspirations, color therapy calendars and the Robyn Nola Healing Art Meditations DVD. www.robynnola.com.